In an extended interview with Katie Fehrenbacher over at Earth2Tech Ian Wright, posing as yet another founder of Tesla Motors, has publicly laid out his plans for a 1000 hp AWD series hybrid - extended range EV supercar that 'might' be ready in 12 - 18 months, or was it going to be a light truck? Coming from Wrightspeed, a five year old start up car company that has built only a single EV conversion out of an Ariel Atom chassis powered by an AC-150 powertrain sourced from AC Propulsion, those sound like bold claims. In part two of the interview it gets even more interesting when Wright starts talking about reducing the weight of a 250 hp electric motor from 110 lb down to only 40 lb. Something smelt like BS so I decided to look into it in a bit more depth. What we're confident Ian Wright is referring to are motors, in fact the entire powertrain, from a UK company called Evo Electric. Their series hybrid system was featured in the Lotus Evora 414E Hybrid concept car which was said to be powered by only a 35 kW, 1.2 litre, three cylinder as a plug-in series hybrid but with 300 kw worth of electric motors driving the rear wheels. 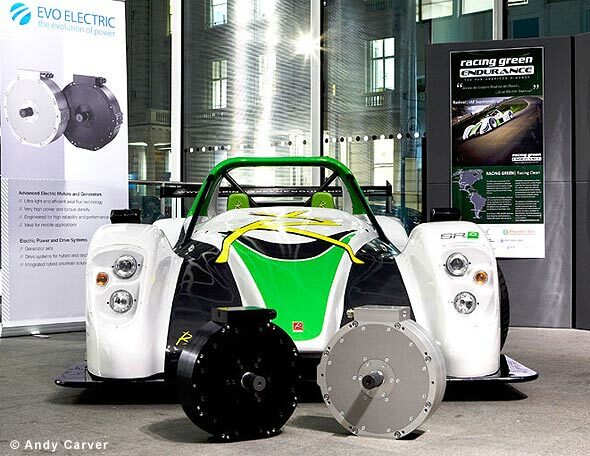 Most recently an Electric Radical SRZero Sports car, currently being driving by students from Imperial college London (Evo Electric is a company spun off from Imperial) up the Pan-American Highway from Argentina to Alaska, features two of the same Axial Flux electric motors and just yesterday Reynard published a photo of their new sports car with a single Evo Electric motor almost driving the rear wheels. While Evo Electric has recently sent out a press release claiming they are 'pushing the boundaries of electric motor technology' we think they should perhaps rephrase that. They're certainly pushing the boundaries of something but perhaps that's credibility. The motors in question are Axial Flux BLDC permanent magnet synchronous motors. One of the advantages of axial flux, which use a disc rotor, over radial flux, which use a barrel shaped rotor, is that motor torque in a AF motor is proportional to the motor radius cubed. In a more common radial flux motor torque is proportional to the motor radius squared. Quite a difference. The AF-140 used in all these vehicles, With a Diameter of 380 mm and only 115 mm thick, mounts in-board on the chassis with one directly driving each rear wheel. The company head-lines peak power figures of 167.5 kw (227.8 hp) and 600 Nm of torque for each motor. It seems to be EV industry standard now to quote only peak outputs, after-all, the Tesla motor is actually rated at 50 Kw continuous yet they publicize only the 185 kw peak power figure. We think Evo might be pushing it a bit too far in their case. 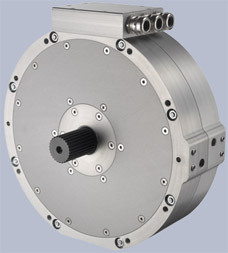 Industrial electric motors are routinely quoted for peak and continuous power output. Continuous being self explanatory and peak being how much power output can be obtained before the temperature rise de-rates the motor, usually over approx 10 - 20 minutes. The company literature for the AFM-140 is quoting peak torque outputs in the microburst range of 18 - 60 seconds. We can only presume they're doing the same with peak power output. Ian Wright was close when quoting the power to weight ratio for these motors, but they weigh 40 kg each, not 40 lb. The method used to calculate power density, we think, is pushing the boundaries of credibility too. A 17' diameter wheel turns something in the region of 1500 rpm at 100 mph. The Evo Axial Flux motors are in-board wheel motors, that in direct drive configuration, will therefore only ever see a maximum around 1500 rpm yet the base speed where they achieve maximum power is 5000 rpm. Torque x rpm / 5252 = hp so they're a fair way short of maximum claimed power at any usable road speed which is more likely less than 25% of base speed. Maximum Rpm isn't necessary to get max torque from electric motors, as we all know. Electric motors have 100% torque from zero rpm, the main reason why they are so blisteringly fast off the line. With two Evo motors in the back of a sports car, such as the Radical SRZero, you'll have 600 Nm from each (for 18 seconds at least) giving the car a peak of 1200 Nm at the rear wheels. That does sound impressive but it's less than half that of a Tesla. The 3 phase AC induction motor in the Tesla Roadster Sport puts out 400 Nm at the motor shaft. Multiply that by the 8.25:1 reduction gear ratio and we get 3300 Nm at the rear wheels. It's equivalent to the torque multiple most cars get in first gear, but in the Tesla it's available at any speed up to 125 mph. Sure, there are power losses through the gear box, but nothing like enough to knock it down by more than half. So while Wrightspeed's 1000 hp Hybrid monster sounds good in a pit lane chat, even with four motors and All Wheel Drive, it will still have less torque off the line than a Tesla Roadster and will need to reach over 300 mph to make full power. This, of course, is exactly why Mercedes and Audi have added reduction gearboxes to the in-board wheel motors in their AWD EV Sports cars. It also has alot to do with why Audi thought they could get away with a bit of BS of there own when they inflated a total of 682 Nm (501.5 ft/lb) across all four motor shafts into 4500 Nm (3319 ft/lb) at the press release. Audi ignored accepted auto industry standards and quoted torque for the e-tron at the wheels, which is after the torque multiplication of the reduction gearboxes. If Wrightspeed add reduction gears then all the above numbers get thrown out the window, but the trade off is 20 - 30% power loss through the mechanical transmissions, in both acceleration and more importantly in regeneration, resulting in a reduction of the vehicles potential range by 20 - 30%. A gearbox also adds approx 20 kg to each motor which in this case means a 50% increase in weight and resultant reduction in power density. There are direct drive in-wheel motor designs being developed at the moment that are specifically designed to work to a maximum of 1500 rpm. These fall within the US Department of Energy’s realistic targets for 2015 and 2020 (1.3 and 1.6 kW/kg, respectively), and not hyperbole figures like 5 kW/kg peak power density as quoted by Evo.